6’+ Episode 215 is Up! 6’+ Episode 216 is Up! 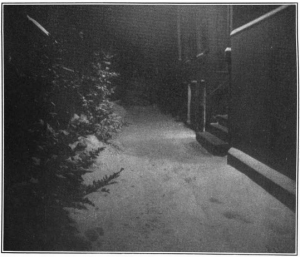 The photograph illustrating this article is the work of Jessie Tarbox Beals, who also created the image used in last year’s installment of “Christma(dnes)s.” It was fascinating to read up on her career in photography. I had no idea she was the very first woman to be hired as a staff photographer by an American newspaper! You can learn more at her Wikipedia entry. I personally feel that visiting Wikipedia is a good first step to get an outline before you seek out more reliable sources of information to verify how much of what you learned is correct. I used this method to make sure the Christmas carol “In dulci jubilo” was really written by a mystic and to confirm that the reference to telling ghost stories in “It’s the Most Wonderful Time of the Year” is a reference to the old British tradition (and not my ears playing tricks on me). Fans of Gravedigger’s Local 16 should recall my looking at said tradition in 2010, 2011 and 2012. More specifically, how it stemmed from the success of Charles Dickens’ A Christmas Carol all the way back in 1843. But what I didn’t know until recently was how it wasn’t the first time Dickens had wrote a Christmas story about an encounter with the supernatural! That honor goes to his 1836 short story “The Story of the Goblins who stole a Sexton.” Robert Louis Stevenson wrote his own tale of Christmas redemption through spirits in 1885 called “Markheim.” But don’t expect something as cheery as A Christmas Carol. This is the work of the man who created Mr. Hyde, after all. The lack of a similar mainstream “ghost stories at Christmas” tradition in the USA owes much to Dickens’ iconic tale having been published long after American independence. But why did it take so long for the Krampus and company to reach their current level of popularity in America? The answer involves a surprising amount of alcohol and orgies! Speaking of weird historical facts, “Dance of the Sugar Plum Fairy” was once used as the soundtrack of an ancestor of the modern haunted attraction as we know it! Its being played on the glass armonica (and being heard by an intoxicated audience) probably helped up the scare factor. You can hear Tchaikovsky’s classic being played on that particular instrument if you want to get a better idea of what the experience was like. Speaking of spooky Christmas music, it’s time for my annual collection of free downloads! This year brings us Brett W McCoy’s “Black Noel,” DANCE WITH THE DEAD’s “Carol of Bells,” Dave of the Dead Productions’ “Haunted Xmas 2014,” DEATH CAT’s “Suicide Snow Beast,” Rachel F. Williams’ “It’s Not Christmas,” Valentine Wolfe’s “Krampusnacht,” Halloween Spooky Deluxe’s “Halloween In Christmas,” Horror Business’ “All I want for Christmas​.​.​. is your death,” Annoying Customer’s “Silent Night, Deadly Night” and X-Ray Mary’s album The Worst Christmas Ever. Those seeking material that’s more festive than fearful should try Hank West & The Smokin’ Hots’ “Christmas in Space,” Debra Mann’s “Set a Place at your Table for a Zombie” and Darkmood’s surprisingly traditional take on “Silent Night.” Last year’s holiday episode of Six Foot Plus has a mix of music that’s both naughty and nice. “Meredith and CFOX Present Yule-O-Ween” is a fake ad rather than a song, so hopefully its only being able to be streamed shouldn’t be too much of a disappointment. Thankfully the short audio drama The Scarifyers: Mr Crowley’s Christmas can be downloaded for free. Although Stubbys House of Christmas usually focuses on Christmas music, they also have a Halloween section! Zombie Christmas! is another website which mixes the two holidays. Those who appreciate its selection of projects might enjoy the following tutorial on making a talking ghost prop using a Douglas Fir singing tree. Geek Crafts has an amazing assortment of horrorday crafts like a Cthulhu tree topper, homemade Plants vs. Zombies stockings, Cthulhu mittens, a Krampus sweater and two papercraft Krampus toys! I also found templates for a zombie snowflake and a Jack Skellington door decoration. But I doubt you’ll need the template since that last craft is so easy to make. The Everyday Is Halloween Facebook page found some homemade Jack Skellington ornaments, monster and zombie ornaments and zombie silhouette ornaments. Amazon also has some Halloween-inspired Christmas ornaments, along with a gingerdead cookie cutter, Ghostbusters II Christmas action figures, Lego Santa Darth Maul, an alien Santa sweatshirt, an ugly sweater-style Santa and aliens shirt and a vintage VHS release of Santa Claus Defeats the Aliens. Yes, it is just Santa Claus Conquers The Martians with a new title. I suspect that particular film inspired the creation of the following books (no matter what title it was seen as): Santa Claus vs The Aliens, Aliens Love Panta Claus and Santa Claus vs. The Aliens: A Christmas Wish. Those seeking creepier Christmas books should appreciate The Twelve Frights of Christmas, Slay Bells, Collected Christmas Horror Shorts, Christmas Ghost Stories: A Collection of Winter Tales, Grandpa’s Witched Up Christmas and The Littlest Shoggoth: A Holiday Tale of the Cthulhu Mythos. Speaking of Lovecraft, the H.P. Lovecraft Historical Society released a new, two disc installment of their Dark Adventure Radio Theatre audio drama series! It’s called A Solstice Carol and uses a Christmas framing story to link audio adaptations of “The Festival,” “Pickman’s Model” and “The Outsider” together. As always, there’s plenty of props thrown in for good measure! They’re also offering their famous tentacle stockings for individual sale as well! But the H.P. Lovecraft Historical Society isn’t the only one out there with horror holiday offerings on independent web stores. Remember the cover art for the Krampusnacht single by Valentine Wolfe from earlier in this article? It was created for that release by Egregore Design and you can order it as a stationary card, print and many other options! Last but not least, Tweeterhead has a line of official Elvira ornaments! Gravedigger’s Local 16 is not to be held responsible for the content on or anything that may occur (be it good or bad) as a result of visiting any links on the above sites, downloading from them or constructing a project that’s detailed on them. This also applies to any suggestions made here. Attempt at your own discretion.